If you’re limited on space, but tired of washing dishes by hand, the EdgeStar Countertop Dishwasher will be a lifesaver. With a stainless steel interior and spray arm, the unit is durable and built to last. A dish rack and silverware basket is included, and the sleek design includes a windowed front that looks great in any modern kitchen. There is no permanent installation, and instead, the unit uses a quick connect faucet adapter that can hook up to any faucet system. When not in use, the dishwasher can be kept in a cabinet, leaving countertops open for cooking. Finding countertop dishwashers that are both attractive in design and functional can be difficult. This is especially true when shopping on a budget. 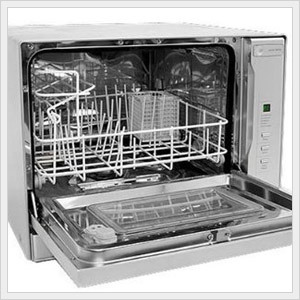 Yet the EdgeStar countertop dishwasher has an affordable price tag and excellent reviews regarding its washing ability. It gets dishes clean and has an internal water heater that heats water up to 185 F degrees and features a rinse agent dispenser to reduce spotting on dishes. Has a stainless steel interior, a powerful spray arm and silverware basket. Features an internal water heater with Saniwash option to heat water up to 158°F. Quick connect adapter included to fit most kitchen faucets and countertop dishwasher is low enough to fit under most cabinets. Lastly the sleek windowed door makes a stylish addition to any modern kitchen. Some consumers have complained about the size of the dishwasher, claiming that it doesn’t hold the 11” plates it specifies. There have also been concerns regarding the tabletop dishwasher leaking. It’s recommended that the setup is done carefully and the hoses are tightened with a wrench, not by hand. Online feedback from owners say that the EdgeStar countertop dishwasher is a great buy, as it fits in small places, offers exceptional cleaning power and quick cleaning cycles. For those in need of a small portable dishwasher, this unit is the perfect compromise and will change the way you clean your kitchen! Please share with us any of your questions or comments concerning this Countertop Dishwasher review! Here’s the manufacturer link for the EdgeStar Portable Countertop Dishwasher with Digital Controls.